Sell More of Your Services to More, Bigger, and Better Clients - at the Fat Fees You Deserve and Want Them to Pay You - Starting This Month! Now you...yes you...can increase your personal income $100,000 to $200,000 a year or more - simply by becoming much more effective at selling your services to potential clients, at the fees you want to charge. I'll be mentioning a LOT of Bob Bly books in this newsletter...for very good reason. The small business content and advice he offers is hands-down some of the most valuable advice...tried, tested, and true...that can be had, anywhere, any time. And it's easy on the pocketbook. 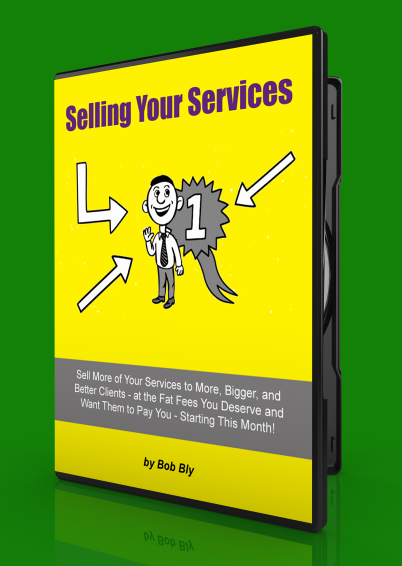 Click the link below to download Selling Your Services and get started in just a few minutes.